Located on the D 215 between Burzet and Lachamp Raphaël. 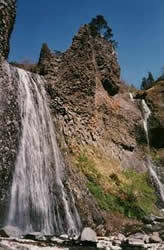 and a protected nature reserve since 1931, Ray-Pic waterfall tumbles 60 metres down beautiful basalt cliffs. The river Bourges fountains from volcanic lava flows 35,000 years old. 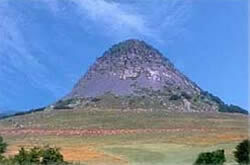 The Mont Gerbier-de-Jonc on the Ardèche mountain plateau is a pile of phonolitic rocks 1551 metres high and the source of the river Loire which flows to the Atlantic. Walk up to the summit in 30 minutes for amazing views. There are over 100 caves and holes in Ardèche.. Inhabited for over 30,000 years, they bear witness to the origins of mankind.. Discovered in 1994, Chauvet cave contains over 400 wall paintings - the oldest paintings yet found in the world. 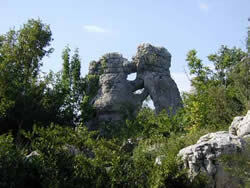 Ardèche people created one of the earliest civilisations on Earth! The vineyards in southern Ardèche produce many different wines due to the diversity of grapes and soils ranging from honest local wines to top class AOCs - and sophisticated wines competing to obtain the coveted AOC "appellation controlee" label. 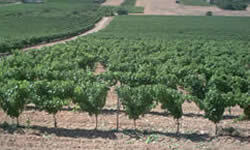 Grapes – and the wine they make- are now the most important crop here.